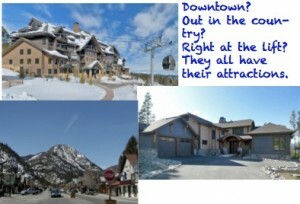 One of the first questions I ask buyers before we go to see any property is where do you want to be in Summit County? Often, they don’t know and their answers begin with “well, we like to…” (fill in the blank) ski, bike, hike, snowshoe, shop, look at views, have a clubhouse, and so on. So what attracts people to different areas of the County? Some skiers like the convenience of walking to the lifts and being right in the heart of the ski village experience. Of course Keystone, Breckenridge, and Copper Mtn. make that easy, but not inexpensive. Moreover, if you are at the lifts, you are as far away from the other three ski areas as you can get in the county. The summer and in-between season activity can be slow at Keystone and Copper. Breckenridge, being a real town as well as being next to the lift combines a lot of attractions and prices reflect that by generally being the highest in the County. Other skiers like to be centrally located and all four Summit County ski areas are about the same distance from Wildernest, Frisco and Dillon. Being in town in Dillon or Frisco gives non-skiers the convenience of walking to shops, restaurants and the post office and the feel of a real village, not a constructed one. The towns have events like July 4th parades, barbeque contests, and art shows all year round. But being in town is more expensive than out of town and towns lack the secluded feeling that some like. That brings up Wildernest, Summit Cove, Corinthian Hill and other neighborhoods not in a town. These each have a different appeal. Some have spectacular views, others have hiking, snowshoeing and biking right out your door. Still others have a more suburban feel that appeals to some city dwellers. All of them will give buyers more for the money in terms of size than either properties at the lift or in town. The next question from buyers is often “which area is the most popular and will appreciate the most?” There is no good answer to that. All have appreciated at about the same rate, although starting from different price levels, for many years. The point is to find the place that you enjoy and when you go to sell, there will be another who likes it for the same reasons you did. Educating buyers (and sellers) is the largest part of what I do for a living so answering these questions comes with the territory. Ask away. And I’ll ask lots of questions, too, so I can narrow your search. You’re not expected to know all this stuff, that’s what I’m here for.